HOUSTON, (Horseback) – The leadership of the wild horse preservation movement in America got a VIP tour of the Bureau of Land Management’s worst nightmare late Friday when they finished a jam packed day with dinner at the proposed Fossel Bed National Monument site. There, the bones of prehistoric rhinos and horses stick out of the Nevada landscape. The site, among others, is the birthplace of the horse as a species. 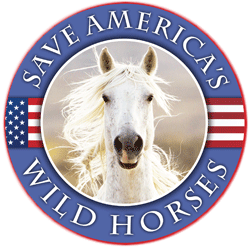 HOUSTON, (Horseback) – Little has changed in the federal Bureau of Land Management’s handling of wild horses under its Wild Horse and Burro Program, this in spite of the worst drought affecting Midwestern states since the dust bowl of the 1930s. What’s more, nothing will change, despite a threat from nature that could put thousands of animals in jeopardy. HOUSTON, (Horseback) – Horseback Magazine had hoped to cover the upcoming pro-horse processing Summit of the Horse in Oklahoma City beginning April 2, however, the fiery tempered president of United Horsemen, the presenting sponsor, has barred this magazine’s first amendment right to cover a news story of interest to all horse owners. HOUSTON, (Horseback) – Unconfirmed reports reached Horseback Magazinelate Wednesday that Texas Prison Horses sold at auction in Huntsville recently may be among hordes of starved horses awaiting transport to slaughter at the border town of Presidio. HOUSTON, (Horseback) – In documents obtained by the animal advocacy group, Animals Angels, and provided to Horseback Magazine,61 Texas prison horses sold for between $102 – $852 each at a Huntsville, Texas auction. HOUSTON, (Horseback) – An employee in the Denver office of the federal Bureau of Land Management has been outed as advocating a hunting season for wild horses in the west. The employee’s email was traced after it was sent to author R.T. Fitch’s “Straight From the Horse’s Heart” blog. Fitch, a fierce opponent of current BLM stampede, capture, and hold, policies traced the email address to BLM NOC OC-330, Denver Federal Center, Bldg 40 – the agency’s National Operations Center.